Everyone's Been Asking - What is Bitcoin? Learn the Ins and Outs of Bitcoin, the elusive new currency, including Bitcoin Mining, how to buy, sell and invest, and how you can achieve long term profits! Bitcoin has been brooding within the tech community over the last few years. However, within the past few months, Bitcoin has exploded into the mainstream and is being covered in every notable new source with commentary almost everyday. Bitcoin Mining and how to become a "Bitcoin Miner"
Silas Barta	works	as	a	software	developer	in	San	Francisco	and	has	been	involved	in	several	Bay	Area	startups. He	first	learned	of	Bitcoin	while	role-playing	the problem	of	how	non-human	intelligences would	interact	with	the	global	financial	system	despite	lacking	citizenship,	after	which	he	built	a	liquid-cooled	mining	rig	from	off-the-shelf	graphics	cards. 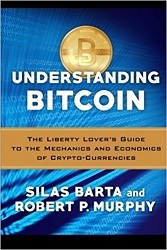 Robert	P.	Murphy is	an	economist	specializing	in	free-market	education	of	the	intelligent	layperson. He	is	currently	Research	Assistant	Professor	with	the	Free	Market	Institute	at	Texas	Tech	University. He	has	a	PhD	in	economics	from	New	York	University.